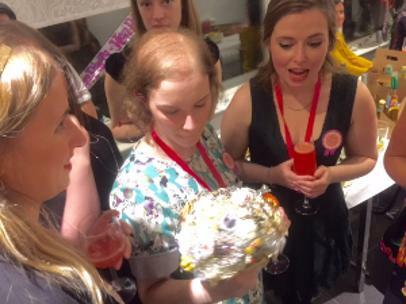 We received a call from Emma's sister Katie a few weeks before her Hens Party asking us about making a Bouquet of memories at Emma's Hens. 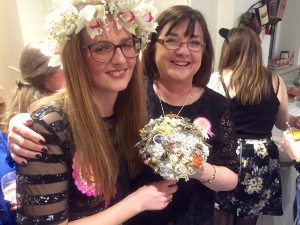 Delighted to be asked as Emma is a like a Niece to our Tutor Janette we jumped at the chance to make this special bouquet. It was Katie's job to get in touch with Emma's friends and ask them to bring some mementos of Emma's like with them. Well they did not let us down, we have an amazing selection of brooches, pins, badges and jewelry to choose from. 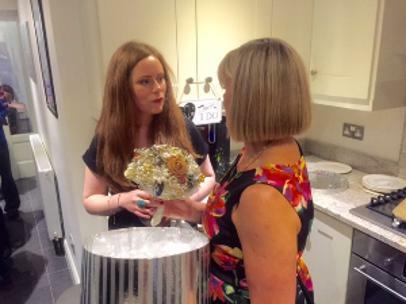 As each piece was added to the bouquet, each guest explained the story behind why they choose the momento. Some stories they were willing to share and some drew a giggle from both Emma and the her friends and we knew there was a story behind the piece that was not for sharing. Some friends could not make the party but they sent their gifts along with cards of explanation. Janette our Tutor and Emma's God Mother had got some of our Photo charms made up with Photos of Emma as a Baby wearing the first T-Shirt Janette had bought for her, and also a photo frame with a photo of Emma's Grandparents on their wedding day. Gloves Emma's mum wore on her wedding day were turned into roses and were also included in the Brooch Bouquet of memories & as Emma is a scientist we also had some scientific symbols included, her prefect badges from her time in secondary school, key rings representing her first car, and symbols of Paris where Emma and Dave got engaged were just some of the things included. 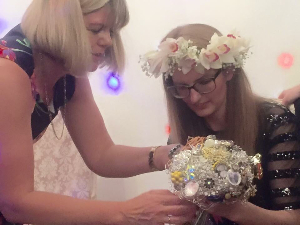 An amazing night was had be all, the Brooch Bouquet of memories was passed all around the guests during the night, and lots of photos were taken of the bouquet. Katie was delighted she had organised this to happen during the party, and it was all done and dusted within less than an hour so the party stayed in full swing. 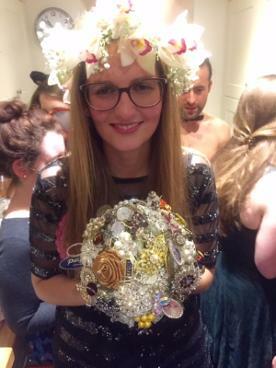 Emma gets married on the 29th of |December and we cant wait to show you photos of her with carrying her Brooch Bouquet of Memories.